Be the first to share your favorite memory, photo or story of Lavecha. This memorial page is dedicated for family, friends and future generations to celebrate the life of their loved one. 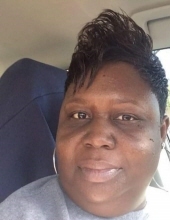 Mrs. Lavecha Parker Coleman, 46, of Little Rock, Ar departed this life on Tuesday, April 9, 2019. She was born on January 25, 1973 in Little Rock, Ar to Earlene Parker and the late Andrew Jackson, Jr.
She is survived by her husband Sammy Coleman of Little Rock, AR; four daughters Mercedes Martin, Sammeka Coleman, Sammyra Coleman and Samone Coleman, all of Little Rock, AR; mother Earlene Parker of Little Rock, AR; one stepson Kelsy Coleman of Carlisle, AR; two sisters Dianna Jackson of Sherwood, AR; Christina Black of Little Rock, AR; one brother, Andrew Jackson, Jr. of Little Rock, AR; three grandchildren and a host of other relatives and friends. Funeral services will be held 11:00 am, Saturday, April 20, 2019 at Divine Grace Church, 5313 Mabelvale Pike, Little Rock, Ar. Visitation one hour prior to service. Interment Valley Pine Cemetery (Hardscramble Community) in Little Rock, Ar. Services entrusted to Larry G. Acklin Funeral Home, 8821 Colonel Glenn, Little Rock, AR. "IN YOUR TIME OF NEED...WE CARE." To send flowers or a remembrance gift to the family of Lavecha Parker Coleman, please visit our Tribute Store. "Email Address" would like to share the life celebration of Lavecha Parker Coleman. Click on the "link" to go to share a favorite memory or leave a condolence message for the family.